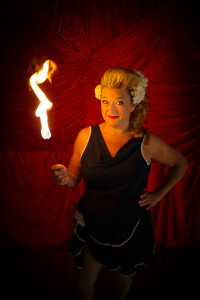 Annabelle is a rare breed, the only female knife thrower, street theater performer and compere based in the UK. As a knife thrower and ring mistress, she learned her craft in traditional circus andhas made the knife throwing act her own in her own special way. Audiences in award nominated shows (Fatal Femmes & Twisted Vaudeville Circus in Perth Fringe) Australia, Dubai, Ireland, Spain, Belgium and Germany to London’s National Theatre and the West End’s Café De Paris have enjoyed her shows. As a compere and MC she is versatile and has her own style likened to Joan Simms from Carry On films to formal Ring Mistressing. She has performed with traditional circus such as Fossetts Circus in Ireland and shows in the UK. She can work a family audience (eg Shambala Festival), enjoys a lively audience (eg hosting at flamboyant Grand Palace of Entertainments at Bestival) AND hold a late night crowd – Tobacco Factory New Year’s Celebrations for Bristol Mayor George Ferguson amongst many others. With her knife throwing, she has found a perfect blend of comedy and danger and presents the ancient skill in a more contemporary, theatrical way. From over-excited showgirl to West Country council estate cowgirl to warm and friendly murderous housewife Bunny to more traditional, higher status act with fire eating and fakir as well as broken glass. She chooses a man from the audience as her volunteer and turns around the traditional roles of a man throwing knives at a woman.